CARRIE DASHOW dropped a large dollop of lemon sorbet into a glass of Guinness, stirred, drank and proclaimed that it tasted like a "chocolate shake." Nearby, Yuka Yoneda tilted her head back as her boyfriend, Albert Yuen, drizzled Tabasco sauce onto her tongue. She swallowed and considered the flavor: "Doughnut glaze, hot doughnut glaze!" The host was Franz Aliquo, 32, a lawyer who styles himself Supreme Commander (Supreme for short) when he's presiding over what he calls "flavor tripping parties." Mr. Aliquo greeted new arrivals and took their $15 entrance fees. In return, he handed each one a single berry from his jacket pocket. "You pop it in your mouth and scrape the pulp off the seed, swirl it around and hold it in your mouth for about a minute," he said. "Then you're ready to go." He ushered his guests to a table piled with citrus wedges, cheeses, Brussels sprouts, mustard, vinegars, pickles, dark beers, strawberries and cheap tequila, which Mr. Aliquo promised would now taste like top-shelf Patrón. 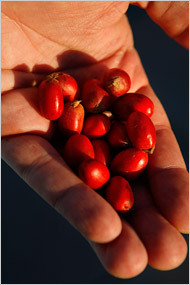 The miracle fruit, Synsepalum dulcificum, is native to West Africa and has been known to Westerners since the 18th century. The cause of the reaction is a protein called miraculin, which binds with the taste buds and acts as a sweetness inducer when it comes in contact with acids, according to a scientist who has studied the fruit, Linda Bartoshuk at the University of Florida's Center for Smell and Taste. Dr. Bartoshuk said she did not know of any dangers associated with eating miracle fruit. 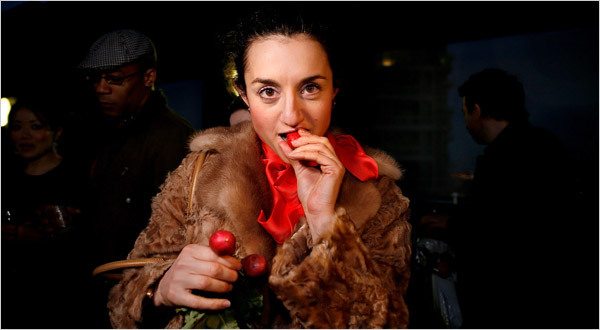 Sina Najafi, editor in chief of the art magazine Cabinet, has featured miracle fruits at some of the publication's events. At a party in London last October, the fruit, he said, "had people testifying like some baptismal thing." The berries were passed out last week at a reading of "The Fruit Hunters," a new book by Adam Leith Gollner with a chapter about miracle fruit. Bartenders have been experimenting with the fruit as well. Don Lee, a beverage director at the East Village bar Please Don't Tell, has been making miracle fruit cocktails on his own time, but the bar probably won't offer them anytime soon. The fruit is highly perishable and expensive - a single berry goes for $2 or more. He cautioned that not everyone enjoys the berry's long-lasting effects. Despite warnings, he said, one woman became irate after drinking one of his cocktails. He said, "She was, like, 'What did you do to my mouth?' "
Mr. Aliquo issues his own warnings. "It will make all wine taste like Manischewitz," he said. And already sweet foods like candy can become cloying. The party last week was his sixth "flavor tripping" event. He hopes to put on a much larger, more expensive affair in June. Although he does sell the berries on his blog, Mr. Aliquo maintains that he isn't in it for the money. (He said he made about $100 on Friday.) Rather, he said, he does it to "turn on a bunch of people's taste buds." Mr. Aliquo sent invitations to a list of contacts he has been gathering since he and a friend began organizing StreetWars, a popular urban assassination game using water guns. One woman wanted to see Mr. Aliquo eat a berry before she tried one. "What, you don't trust me?" he said. She replied, "Well, I just met you." Another guest said, "But you met him on the Internet, so it's safe." Mr. Aliquo gets his miracle fruit from Curtis Mozie, 64, a Florida grower who sells thousands of the berries each year through his Web site. (A freezer pack of 30 berries costs about $90 with overnight shipping.) Mr. Mozie, who was in New York for Mr. Gollner's reading, stopped by the flavor-tripping party. Mr. Mozie listed his favorite miracle fruit pairings, which included green mangoes and raw aloe. "I like oysters with some lemon juice," he said. "Usually you just swallow them, but I just chew like it was chewing gum." For all the excitement it inspires, the miracle fruit does not make much of an impression on its own. It has a mildly sweet tang, with firm pulp surrounding an edible, but bitter, seed. Mr. Aliquo said it reminded him of a less flavorful cranberry. "It's not something I'd just want to eat," he said.